The Super Mamas Guide to launching your own podcast in 8 easy steps. When we started Super Mamas back in 2015, we didn’t know much about podcasting, but we loved the idea of being able to share our stories about parenting, and womanhood with people from all walks of life. Two years later, we are so happy we took on this adventure. We've received many emails asking us for our own tips on how to start their one podcast. We know it can seem overwhelming, so we put together our tips to how you too can create your own podcast. So great ready to press record and begin this wonderful podcasting journey with us! Develop a concept for your show. What topics do you want to cover? Are you doing an interview show? Will you have local guests or remote guests? How often will you release an episode? What is the length of your show? We are big advocates of doing a weekly show since this helps you create rapport with your audience, and gets you into the groove of recording. This is like a new mini-job you are taking on so make sure that you adjust your schedule accordingly. We recommend you pick a day of the week to release your episodes and be consistent about that schedule. This is also a good time to find background, or theme music for your show. Here is a site where you can free music to download. Whatever image you choose needs to be about 1,400 x 1,400 pixels (3,000 x 3,000 pixels maximum). We suggest you find a local designer who could help you with the design and branding of your podcast. You can find helpful info regarding artwork here. We suggest is that you don’t use the word ‘podcast’ in your name. Like us, our show is called “Super Mamas” the word ‘podcast’ isn’t on the title. It just seems a bit redundant given that it is already listed on a podcasting app. I mean, it’s not like Television shows have the word “show” at the end of every tittle, right? Sound quality is one of the most important elements of your podcast. Your content can be amazing but if your sound quality is poor, it makes it less likely that they will come back for more. HEADPHONES: We highly recommend you invest in a good pair of headphones and don’t just use your regular Iphone buds. Why? Because these will help you listen to the quality of sound when you record. They will also help you listen any echo, or noise pollution that will affect your final product. They will also be useful for editing. These are the ones we use HD 280 Pro. LAPTOP: You will need a computer to edit, and upload your episode to a host, and set up your podcast. MIXER: A mixer is not required but this is how we combine audio when we are recording multiple people. 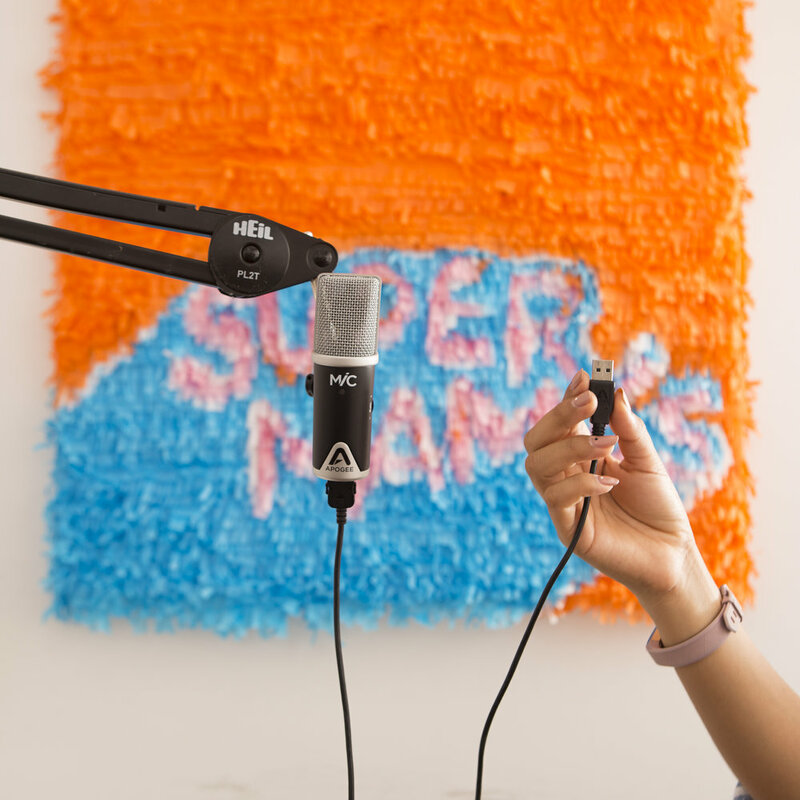 Higher quality microphones can be plugged directly into your mixer. Here’s a site that explains other reasons to consider a mixer. POP-FILTER -A pop filter is just as the name implies, something that you place in front of your microphone to prevent harsh sounds from penetrating your audio. Here is the one we use. DIGITAL RECORDER-You can use this to record at events or to record guest when traveling. Here is the one we use. If possible, choose a quiet environment to record. Large spaces and high ceilings can create an echo. Test your sound before doing a full recording. Be patient, you got this! 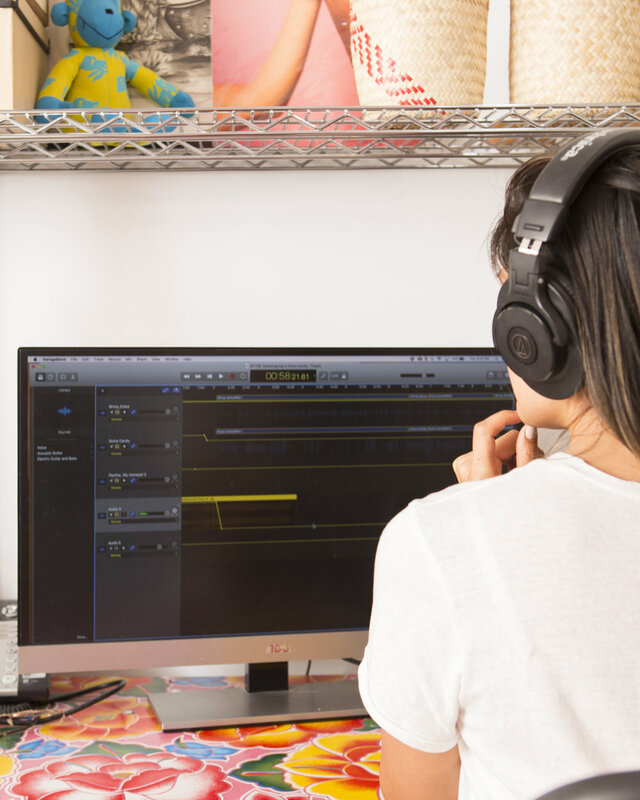 Garageband allows you to edit your recording and listen to any things you might want to erase. For example, long pauses, or background noises. You can also mix in music at this time and create your introduction. Again, don’t overthink this! It’s okay if your first episode isn’t perfect. In terms of editing and production. Be patient. It will take some time, but once you get the hang of it you will wonder why you didn’t start sooner. Here are some tips to get you started with editing. Think of this as the place where your podcast lives. From here it will stream on places like Apple Podcasts, Spotify and others. We chose to host ours with a Soundcloud account but you can choose other services like Podomatic. With Soundcloud we recommend you start with a free account and upgrade to “Pro” once you see a need for more stats and upload time. Remember that the most important piece of information here is the RSS Feed. Don’t get scared by the name. It’s basically just a URL you need to copy and paste in iTunes. *EDIT* - Most recently, we have migrated our hosting to Libsyn. Their customer service is superb and they can help in getting your show published in Youtube, Spotify and even iHeartRadio! This link is your RSS feed. Make sure to also check privacy settings to make sure your RSS is public that's how it will update with Itunes and other streaming services. 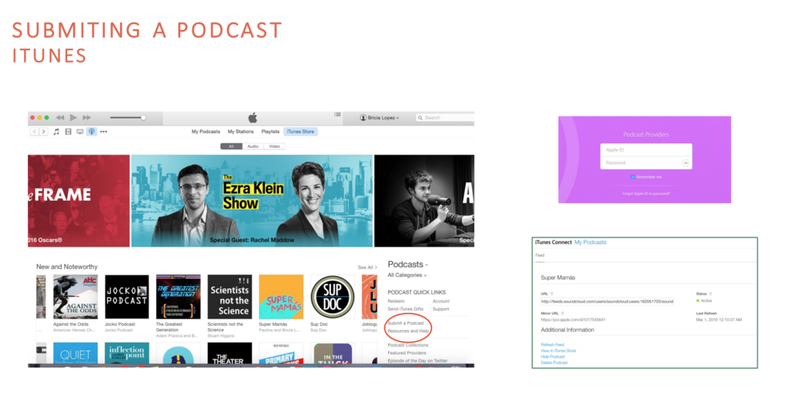 On the main Podcast iTunes page you will see a link that says “submit podcast”. It will take you 3 minutes to do this. It is so easy. All it will ask you for is your Apple ID, some basic info about your show and the RSS feed code (you will get this from Soundcloud). However, it does take up to 7 days for iTunes to approve your podcast link. But just be patient. This is where you enter your RSS feed to have your podcast stream on Itunes. 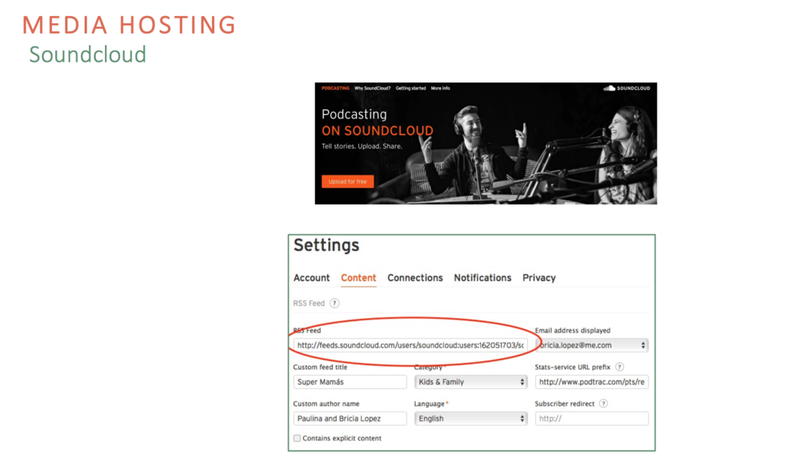 We suggest you upload your first episode on soundcloud prior to you getting your account approved on iTunes. That way once it is approved, you already have an episode published. BUT, don’t promote it until it is already on iTunes. it will just be easier for people to find you that way. You can stream it on various places like Spotify and Stitcher. Tell your friends and family about your new project. Use your social media channels to promote. Encourage people who do listen to leave you a review and subscribe. Create social media channels for your podcast, and if you want to go the extra step, purchase the domain for it. If you have more questions don’t hesitate to ask! We are always here to support our sisters in making their dreams come true.